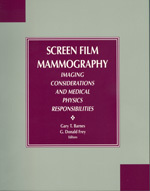 This book presents the proceedings of the mammography symposium held in Columbia, South Carolina in April of 1990 in conjunction with the Southeastern Chapter of the Amercan Association of Physicists in Medicine (SEAAPM) annual meeting. The symposium covered the latest information on appropriate physics measurements and responsibilities in mammography. It also provided guidelines for obtaining high-quality mammographic images while exposing patients to reasonable amounts of radiation.